Select objects, shapes, pictures or text boxes, to change or move them. Sizing handles indicate that a shape or object has been selected. Which Office app are you using? To select all of the text in the document, click Select All. To select objects that are hidden, stacked, or behind text, click Select Objects. To select an object, click when your pointer becomes a selection arrow as it moves over an object. To select multiple objects, press and hold Ctrl while you click the objects that you want. To select text with similar formatting, click Select All Text with Similar Formatting. Note: In Word 2007, the Select tools don’t work on inserted images. To select images, we suggest that you insert the images into a drawing canvas. When you insert shapes and images in a drawing canvas, you can select them by dragging a box over the objects. For more information, see Add a drawing to a document. To select objects that are hidden, stacked, or behind text, click Select Objects, and then draw a box over the objects. To open the task pane where you can select, multi-select, show, hide, or change the order of objects, click Selection Pane, and then click the options that you want. To select all of the objects and placeholders on the slide, click Select All. To open the selection pane, where you can select, multi-select, show, hide, or change the order of objects, click Selection Pane, and then click the options that you want. Press and hold Shift or Ctrl while you click the objects. Select an object that is under other objects and cycle forward through the stack of objects. Select the top object, and then press Tab. Select an object that is under other objects and cycle backward through the stack of objects. Select the top object, and then press Shift+Tab. Select objects that are part of a group. To select one object, click the object. To select multiple shapes in a group, press and hold Shift or Ctrl while you click the shapes. Cancel the selection of one object at a time. Press and hold Shift or Ctrl while you click each object. If clicking to select isn't sufficient, or if you have many objects to keep track of, try the Selection pane, as described below. Select one of the objects you want to manage. Select the ... 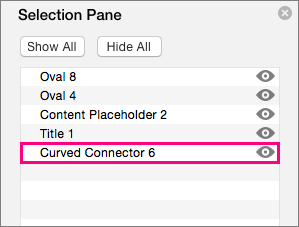 Format tab that appears on the ribbon when you select the object, and then choose Selection Pane (or Arrange > Selection Pane). Drag an item up or down in the list to change the order. 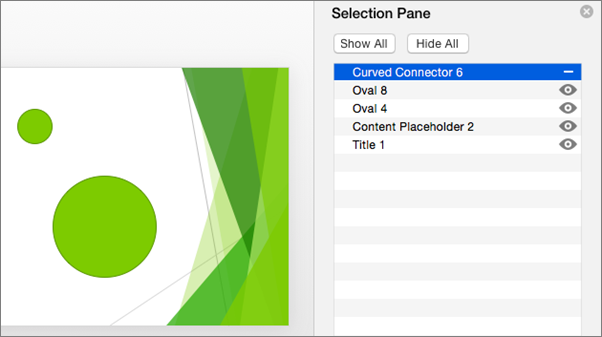 In the example below from PowerPoint, moving the curved connector to the top of the list also brought it forward in front of the two oval shapes (and everything else on the slide). The connector is at the bottom of the list, and is behind the two oval shapes. After the connector is moved to the top of the list, it appears in front of the two oval shapes. Choose to show or hide objects from the Selection Pane. 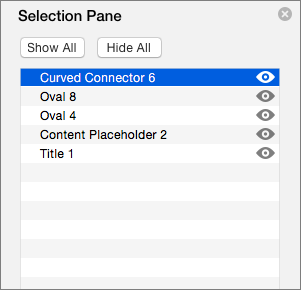 To hide an object, click the eye icon in the Selection Pane indicating that the object is Showing . 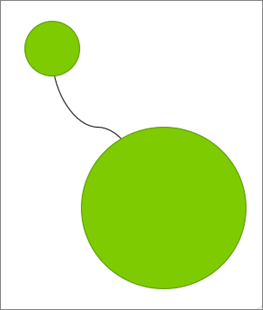 The icon will change to a simple icon indicating that the object is Hidden from view. To show the object once again, simply click the Hidden icon , and the object will reappear. 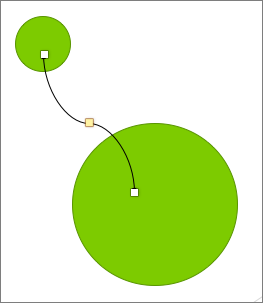 The connector in the example above is hidden, and does not appear on the slide. Group or ungroup objects listed in the Selection Pane. 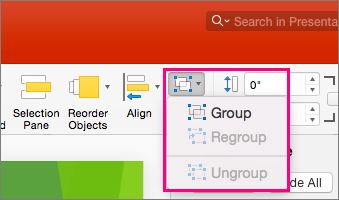 If you select multiple objects by using Command + Click, you can then group them or ungroup them by selecting Group Objects on the ribbon in the Format tab.